RIO DE JANEIRO, BRAZIL – With demand for available and affordable accommodations in Rio during the upcoming World Cup increasing, two property developers, Andrew Allan and Steve Pike, saw a business opportunity. Together the English expatriates founded World Cup Camping Rio, a campsite in the Zona Oeste (West Zone) neighborhood of Recreio, that will offer soccer (football) fans from around the world a viable accommodation alternative during their stays in Rio. World Cup Camping Rio 2014 campsite in Recreio, photo courtesy of World Cup Camping Rio. The two friends originally meet in school in Seaford, Sussex, England. Andrew Allan was the first to arrive in Rio and launched the Real Property Holdings (registered as RPF Construção Ltda in Brazil), and Steve Pike, who previously worked on “talent identification initiatives” for UK school sports, arrived in Rio in 2012. “We build for the lower to middle Brazilian residential market using investment from expat investors in Brazil and all over the world,” Pike added. “So, we were very confident that supporters would be open to the idea, and we knew that demand for affordable accommodation would be high and we are fortunate enough to be in the perfect position to be able to react to the opportunity,” Allen continued. 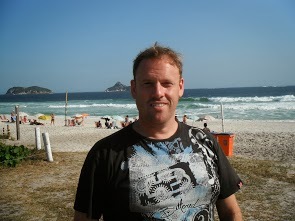 Andrew Allan of World Cup Camping Rio and Real Property Holdings, photo courtesy of World Cup Camping Rio. 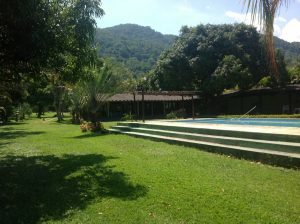 Charging only R$140 per person per night for tent rental packages, the campsite is located in the neighborhood of Recreio with views of the city’s Zona Oeste forests and mountains. In addition to the beaches just minutes away from the location, there will also be an onsite pool for guests of the campsite. Bars and television screens showing live games will entertain the campers onsite, while World Cup Camping Rio 2014 staff members will also be available to assist with campers traveling to São Paulo and Belo Horizonte for England’s group matches during the Cup. To help the campers enjoy their stay and the games safely, the site will also offer 24-hour professional security. “We know that some of the biggest concerns for supporters planning to visit is security and the cost of internal flights for those planning to follow their team,” co-founder Andrew Allan told The Rio Times. “Brazil is the spiritual home of football. The passion for the game here is incredible and so we believe that the 2014 World Cup has the potential to be the greatest ever,” said Pike who says they have had a great deal of interest from supporters and stronger ticket sales than anticipated thus far. The campsite will open at 10AM on June 8th and close at 4PM on July 15th. It will be able to accommodate up to 800 visitors at a time. We’ve also set up a camp site at Saquarema aimed at the World Cup. We’re on a beautiful orange farm just south of Saquarema just over an hour to the Maracana. Any chance of a write-up?